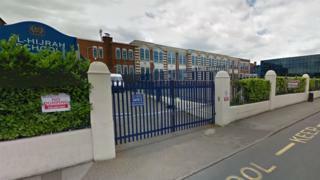 A nine-year-old boy died after suffering a suspected allergic reaction at school, police have said. The pupil collapsed at the Al Hijrah School in Bordesley Green, Birmingham, at about 14:20 GMT on Friday. He died at nearby Heartlands Hospital. Police said they are working with the school and Birmingham City Council to establish the circumstances surrounding his death. A post-mortem examination is expected to be carried out soon. Colin Diamond, executive director for education at Birmingham City Council, said the school was "doing all it can to support the family through this terrible time". Brigid Jones, the city council's cabinet member for children, families and schools, said on Twitter: "My thoughts are with the family of the young man who tragically died following an incident at school yesterday."